The three distinct pillars of The Hexagon Board Game Cafe are COFFEE, GAMES, & COMMUNITY. These three words are everywhere -- from their signs out front, to their website, to their social media posts. They live for these words, and it is evident in their actions. Hexagon all came to be when owners Kellie Ho and Randy Wong graduated from architecture school and struggled to find work in their design field. Many hours and late nights were devoted to playing Settlers of Catan, and that devotion continued when they moved to South Korea. This is where they were first introduced to the board game café concept. Board games, a great cup of tea or glass of wine...what could be better? So, upon their return to Canada, they wanted to bring that special, social experience back home. Four years later, they opened Hexagon in 2014 with about 400 games to start. They now have grown their library exponentially and have a second location as of last year(!) -- one in Calgary, and the other in Edmonton, Alberta. Staff are often featured on their social media showcasing their favorite games, and they frequently post new titles that they are adding to their library. They hold 'Monday Meetups' where, if you don't have a gaming group but are looking for one, you can come solo to the café and meet new people who like to play similar games as you. With Fratello Coffee Roasters providing the coffee for their beautiful lattes, cool craft beer, and small batch wines, Hexagon really has created a special place to be their community's home away from home. Tabletop Board Game Cafe opened in 2015 as Cleveland, Ohio's first board game café, adding to the already thriving gaming community in the city. Three short years later and they have accomplished so much! 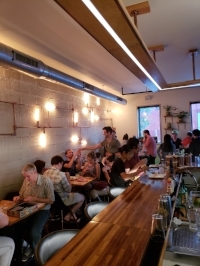 Tabletop was opened by husband and wife team, Brady and Shiva Risner, and their friend Michael Holmes who loved the board game café concept and wanted to give their community a place to gather and disconnect from their devices for a spell. What we love about Tabletop, that sets them apart from their competition, is that they host a wildly popular weekly trivia night that changes in theme each week and gathers a large participation group. They also host fun monthly DIY workshops called "Maker Nights" to guide guests through creating unique one in a kind crafts for them to take home. 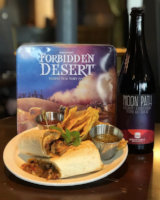 They always have fun game-themed food and beverage options on their menus and their space feels warm and welcoming to all. The Uncommons is Manhattan's first board game café, proudly located in Greenwich Village, in a historical village, right on the NYU campus and just a block from Washington Square Park. Inspired by the widely popular Snakes & Lattes, who we have covered as well(! ), they opened their doors to the public in 2013 after the launch of a very successful Kickstarter campaign. The Uncommons tables are always packed, no matter the time of day or day of the week, and if you are going on a weekend or holiday, they often have upwards of a 2 hour wait for a table. Their location has been paramount to their success and they utilize their space so effectively as to make use of every square foot possible. 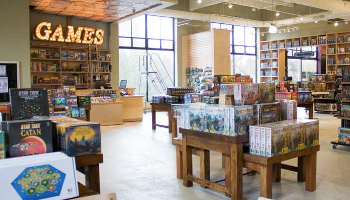 We first visited them over a year ago when we began researching for Bard & Baker and instantly loved the wall of games stacked from the floor to the ceiling, begging to be played. There is even a separate section of the wall dedicated to retail games for purchase. They regularly host demo nights by local and traveling game designers featuring their new games, and often post on social media about new games they get in house. Their food menu is more geared towards light snacks and their beverage program is largely focused around their espresso machine, which is constantly churning out drinks. If you're in the mood for something to add a little more fun to game night, they have wine and beers available for purchase as well. 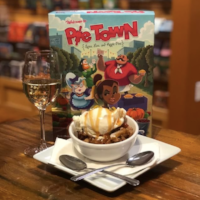 We love visiting The Uncommons to try out new games and enjoy one of their game themed lattes each time we are down in the city -- it is only a two and half train ride from where we are located in Troy! Be sure to follow them on Instagram and Twitter for more news and featured games, and check out their website. Today's featured board game café is the London-pub inspired The Rook & Pawn, located in Athens, Georgia, opened by husband and wife team, Carrie and Tim Kelly. Carrie and Tim opened The Rook & Pawn in 2015 after becoming enamored with board game café concepts in similar locations such as Snakes & Lattes, Game Häus Cafe and The Uncommons. They both have fond memories of board games around the table during family game night, filled with laughter, fun, and friendly competition. After a lot of hard work, renovation of their space, and a successfully funded Kickstarter, they opened their doors to the public with much excitement from the Athens community and will be celebrating their 3rd anniversary this year! We love The Rook & Pawn for their London-pub meets Harry Potter's Diagon Alley interior decor, their consistent social media posts which feature games from their library, tasty drinks, and happy staff. It is evident that Carrie and Tim love the community that they are a part of. Their drinks are always fun and colorful, with tongue-in-cheek game references. We only wish they were closer so we could visit them in person! Be sure to check out their website, follow them on Facebook, Instagram, and Twitter, and check them out if you make your way down to Athens, Georgia! How was everyone's International Tabletop Day yesterday? Speaking of, did you know that B&B is not only NOT the first board game café in the country, but it's not even the first one in the state? There are so many cities around the globe that you may be familiar with, but perhaps never knew had a board game café, such as: Los Angeles, Cleveland, Houston, Athens, Baltimore, Seattle, Manhattan, Utica, Hudson, Toronto, Calgary, Melbourne, Oxford, Beijing...and hundreds more! Over the next few weeks we invite you to join us as we explore some of our favorite ones around the world, while we continue making progress on Bard & Baker. The board game café community is an incredibly friendly and supportive one. We reached out to many of them during the business planning stages of B&B to ask them questions about their board game library, kitchen size, staffing size, number of tables and seats, challenges and joys, etc, and they all happily provided us with very useful feedback to include in our business plan -- so, we are very excited to introduce you to many of them! Have a favorite board game café that you absolutely want to see featured? Be sure to leave us a comment below to let us know!